Tuesday night’s Democratic debate, held at the Citadel in Charleston, South Carolina, was widely anticipated for its groundbreaking format. For the first time, individuals could submit video questions via YouTube to be shown on-screen and answered by the candidates. The submissions varied in content and presentation and engaged the candidates on a wide range of issues, some of which had not been addressed in previous Democratic debates. What follows is an analysis of the format and major themes of the debate as compared with public opinion data. Even before last night’s CNN/YouTube debate, the importance of the internet in politics and elections was well established. In the 2006 midterm elections, 31% of the public used the internet to get political news and information and to email others to discuss the race. Surveys by the Pew Internet & American Life Project found that 15% of Americans used the internet as their primary source for campaign news in 2006, more the double the percentage that did so in the 2002 midterm elections (7%). 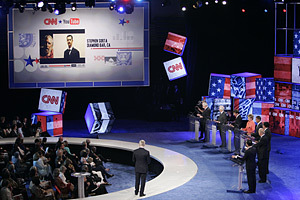 The debate highlighted the emerging role of online videos in the 2008 presidential campaign. Some 15% of adult internet users report having watched or downloaded political videos online and 2% report doing so on a typical day. Recent popular campaign videos have included Hillary and Bill Clinton’s parody of the final episode of “The Sopranos”; “I got a crush on Obama”; John McCain joking about bombing Iran; and a tape of John Edwards combing his hair. Fully 44% of the public have heard of at least one of the four videos and 27% have seen at least one. The YouTube format gave voice to a range of citizens not normally heard on the presidential debate stage. Considering that a 62%-majority of the public disagrees with the statement “most elected officials care what people like me think” it was not surprising that a current of skepticism toward government ran through many of the questions — a sense that little ever changes in Washington and that government today is not run for the benefit of all people. Recent polling by the Pew Research Center for the People & the Press shows that much of the frustration expressed by the YouTube questioners is widely held by the public. Fully 79% of Americans agree that “generally speaking, elected officials in Washington lose touch with the people pretty quickly.” This belief is widely held across demographic groups and Republicans are as likely as Democrats to agree with the statement. It comes as little surprise then, that while Americans are evenly split (45% to 46%) in having a favorable or unfavorable overall opinion of the federal government in Washington, the public is twice as likely to have a very unfavorable opinion of the federal government (15%) as it is to have a very favorable opinion (7%). The public also shares doubts about the competency and role of government. More than six-in-ten Americans (62%) say that when something is run by the government, it is usually inefficient and wasteful.” And a 52% majority does not believe that “the government is really run for the benefit of all the people,” though on this point Democrats (58%) are much more likely than Republicans (36%) to disagree. Additionally, 63% of Americans say that “you can trust the government in Washington to do what is right” only some of the time. Despite the cynicism expressed by the YouTube questions — and shared by the public — seven-in-ten Americans (71%) still believe that “voting gives people like me some say about how government runs things.” This helps explain why individuals took the time to submit around 3,000 video questions — though skepticism towards candidates and Washington exists, the public still views the election process as a way to have their voice heard. In addition to airing some of the dissatisfaction and frustration held by individuals and the public, the YouTube questions also raised issues that had not been addressed in-depth by previous Democratic debates. Tony Fuller of Ohio asked the candidates if they believed women should register for the draft when they turn 18. Responding to the question, both Senator Chris Dodd and Senator Hillary Clinton dismissed the idea of reinstating the draft, and instead spoke of the need for encouraging national service. “We’ve got to get young people back into public service,” said Clinton. A plurality of young Americans agree that their generation is not volunteering as much as young adults 20 years ago. Only 37% of young Americans — those between the ages of 18 and 25 — believe that their generation does more community service and volunteering than the previous generation, while 42% believe they are doing less. A snowman, worried that the issue of global warming was being neglected, asked the candidates what they would do to ensure him and his son a full life. An overwhelming majority of those surveyed in a Pew Forum poll last fall share the snowman’s concerns. Nearly eight-in-10 adult Americans (79%) believe that there is solid evidence that the average temperature of the earth has been increasing over the past few decades; just 17% say there is no solid evidence for this. Most of those who believe that the earth is getting hotter also believe that human activity such as the burning of fossil fuels is responsible: 50% of the general public say this, while 23% say that global warming is mostly a result of natural patterns in the earth’s environment. Later, the candidates were asked about using nuclear power to provide “energy security.” While Senator John Edwards would not endorse nuclear energy, citing the dangers in disposing of its waste, Senator Barack Obama said that it was something American should explore. Only 39% of Democrats favor promoting the increased use of nuclear power according to a February 2006 Pew poll, with 52% opposed. An entire song was dedicated to President Bush’s national education initiative, No Child Left Behind (NCLB). The law though, does not seem to elicit such dramatic opinion, with a plurality of Democrats believing the NCLB has had “no impact” on schools in America. About a third (32%) believe it has made schools worse, while 28% say it has made schools better. Republicans are much more supportive of NCLB, with 48% saying it has made schools better, and only 16% responding it has made schools worse. The candidates were also asked about sending their children to private schools. According to a 2005 Pew poll, 85% of Americans send their children to public schools. There was no difference along party lines. Stephen Marsh from California submitted his video about secular voters getting “snubbed” by Democrats who spend more time addressing religious audiences. The Democratic Party is split on expression of faith and prayer by political leaders, with 34% saying there is too much expression, and 34% saying there is too little. The country as a whole is more inclined to believe there is too little (39%) than too much (26%). Would you allow us to be married…to each other? Will from Boston asked the candidates if African-Americans are ever going to get reparations for slavery. While Pew surveys have not asked about the paying of reparations for slavery, other polls have found large majorities opposed to payments to the descendants of slaves either by the federal government (for example, Gallup reported 81% opposed) or by corporations who once profited from slave labor (74% opposed in the same Gallup poll). In a post-Katrina survey in the fall of 2005 by Pew, by more than two-to-one (59%-26%), more Americans said that blacks who can’t get ahead in this country are mostly responsible for their own condition, rather than being held back by racial discrimination. That is unchanged since December 2004 (60%), and comparable with results dating to 1994. A questioner named Morgan asked Sen. Chris Dodd, “Do you believe the response in the wake of Hurricane Katrina would have been different if the storm hit an affluent, predominantly white city? What roles do you believe race and class played in the storm’s aftermath?” Calling the government’s post-Katrina response “one of the most dark and shameful moments in recent past history in our country,” Dodd responded that he believed “that had this occurred in a place with a majority white population, we would have seen a much more rapid response and a consistent response to that issue.” In the wake of Hurricane Katrina, most Americans did not agree, though reactions divided sharply along racial lines. In an early September 2005 Pew survey, two-thirds of African Americans, but fewer than one-in-five whites, said that the government response would have been faster had most victims been white. Not only were African American respondents far more likely than whites to see a racial dimension in the slowness of the government’s response, but an even higher proportion (71% of blacks compared with 32% of whites) felt that the disaster revealed the persistence of racial inequality. By the same token, 70% of blacks said they felt angry because of events in the storm’s aftermath, compared with 46% of whites. Did Campaign Coverage Move off the Economy? You Betcha!